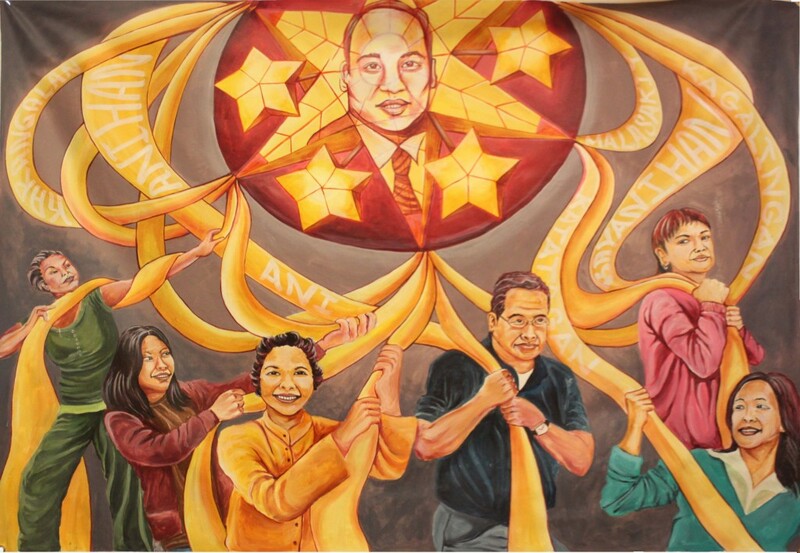 The mural outside the Bayanihan Community Center in San Francisco's SoMa district, by artist Cece Carpio. Bernadette Sy and Teresa Yanga talk about the founding of the Bayanihan Community Center, and Rico Riemedio and Tim Figueras chat about the changing SoMa neighborhood. In 2016, CAAM partnered with StoryCorps San Francisco to gather oral histories in the South of Market neighborhood in partnership with SOMA Pilipinas. Below, we’re delighted to share two of the interview sessions, which have been edited for length. The first is about the founding of the Bayanihan Community Center, a hub for Filipino American culture, arts, education, and social services in the South of Market district of San Francisco. In this rapidly-changing neighborhood, the community center has kept the core history and culture of Filipino Americans central to SoMa. Bernadette Sy and Teresa Yanga about how the center came about. Sy is the Executive Director of the Filipino-American Development Foundation (FADF), which she founded with her father, Dr. Mario Borja. She manages the Bayanihan Community Center. The second is between Rico Riemedio and Tim Figueras. Riemedio grew up in SoMa and worked at United Playaz, a violence prevention and youth development organization in SoMa. 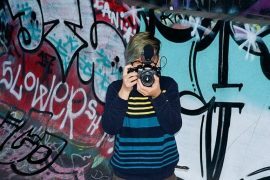 Riemedio talks about what it was like growing up in SoMa and how it’s changed. Figueras worked at San Francisco Parks and Rec in SoMa for nearly 30 years and at Bessie Carmichael Elementary School. Figueras is a member of the Bayanihan Equity Center Board and is actively involved in many other community organizations in SoMa, including SoMa Pilipinas. For all the StoryCorps and CAAM interviews, please check out the archive here. Visit www.bayanihancc.org for more information about the Bayanihan Community Center, and www.unitedplayaz.org for more information about United Playaz. Bernadatte Sy: My name is Bernadette Sy and my partner today is the project manager for the building of the Bayanihan Community Center. Teresa Yanga: My name is Teresa Yanga, I am too also in the FADF office at the Bayanihan Community Center, and my relationship to Bernadette is I helped her get the Bayanihan Community Center underway. I know, it was.. The fire was 1995? Teresa Yanga: It was in 1997? At 1997, I remember the story of fire because I was working with the Bill Sorro at the time and he went to go help the veterans because he was working at the SRO collaborative. And I came to work in the following day and I heard about the fire and then talking to John, he realized that at some points, few weeks after the fire, he wanted to pursue purchasing the building after he met with your dad, Dr. Borja, I recall. Forgive me, this is almost 20 years ago. Bernadette Sy: It was the Monday night before, I believe it there were regular meetings across the street where Miss Saigon is now, they were organizing meetings for the neighborhood and John had an vision to create affordable housing that was respectable to people who were like low-income and homeless. Before the fire, we were thinking that we wanted to operate a nonprofit to operate the building. We were owners already. So we were gonna ask John for a pointers. But the Fire was like, that was deciding factor because we didn’t have the ware with all to rebuild thoroughly damaged building. So tell me more about John telling you that we might buy the building, what was coming through your head, was there any ideas about the community center? Teresa Yanga: So I was actually surprised to find out that there were Filipino owners of the building. My first impression was good for that there was a Filipino property owner because I always heard in the community that concern about lack of Filipino ownership of assets. After we learned and we were gonna buy the building, met your family, realized that you guys had purchased all these actual physical assets, and then having the vision of the community center just open up my eyes even more so about the extent of the community in South of Market. Bernadette Sy: When you said you were interested in social activism, and you didn’t know there was Filipino community here or? Teresa Yanga: I didn’t know at all. Teresa Yanga: It became… if anything that was hard for me to leave especially I had an opportunity to a couple of different job offers, when the Bayanihan project started, I said “ No, I can not leave … because I wanna see this project through.” cause I had so much desire to want, to make a difference. Especially, after your family insisted, “If we buy the building, there’s certain conditions.” such as there’s gotta be a community center on the ground floor and you must name it Bayanihan house. Bernadette Sy: The building was opened in 2003, Bayanihan didn’t get finished until 2005. I remember how, because we wanted to this community center and I actually never came to South of Market. And I think I was forced to. Because there was whole dream about having the community center and me realizing that if you really wanted the community center to happen, you can’t just like tell someone to do it, and it will happen. If I’m gonna put a condition on creating a community center then we have to make sure that it actually happens. Teresa Yanga: Yeah, so you too wanted to see it! Bernadette Sy: Which is how I got my job. Teresa Yanga: Because you were the driving force behind. Having making this center happen. Bernadette Sy: Yeah, so. We wanted to make the community center happen, which is just a building right? So the other part of it, which was the people part, where you had connections with people in the neighborhood because of Rolando. Teresa Yanga: When we were planning the Bayanihan Center, we started VEC ,which is like cause we wanted to make sure we help the veterans, with the displacement because of the fire. Teresa Yanga: Pulling the community together. Bernadette Sy: So it was a way ’cause filipino community wasn’t always galvanized around things. ‘Cause everyone had their different ideas and different values but since that all brought us together, it was really hopeful that we could do that and then. Teresa Yanga: While the fact that we were able to deliver something physically intangible in a positive way even it with just the voluntary labor. Bernadette Sy: So this is pre- Bayanihan, so what was your sense of Filipino community at that time? Teresa Yanga: So there was something missing from the community. Especially coming from, having less of a government role. Being kind of talked down. All these kind of ‘dot comers’ coming in, and community feeling pressured of being displaced. and then it was great that you were focused on VEC. With SUMC gone, there was no planning done at the community level with the community in mind. Bernadette Sy: As we look forward to the cultural district, all the workin groups are coming together and we are all meeting together and we learn from each other. Ant the same thing happened when we were doing the VEC. It was that everyone had a role like you were doing the space because none of us knew about space. I mean that was important though, and then the other piece was the people piece. So we have our own little specialties. What always kept me in the game was that I knew that we had little wins along the way. Teresa Yanga: Sense of accomplishments. Just be able to make it a little rewarding to keep us motivated, to keep going. Bernadette Sy: Any perspectives looking back? Bernadette Sy: Well we have a lot work left to do. I feel like there, created kind of space where we want to allow more people to come in. I think we are trying to hold everyone accountable to the group to making sure that not one person actually does everything, like makes decisions on everything. cause everything should be a community process and I think that a learning thing for everybody. cause somethings may not be the way that they should go, but sometimes you should take the longer route and make everyone realize that. Teresa Yanga: That’s one thing that I’m thankful for is that, If I’m not active in the community, I know there’s a good people like you. or such smart women ,you know, that is hoping to build the upcoming leadership in your organizations. Bernadette Sy: Yeah, cause it is bigger than all of us. and it can’t just stop like in 2016 or when we decide to leave. Rico Riemedio: My name is Rico Riemedio and we’re here at the Bayanihan Center and my relationship with Tim is like good friends that advocate for youth here in SoMa. Tim Figueras: As Rico said, I am Tim Figares, 59 years old and like Rico said we’re really close friends who advocate for the community and the kids in the South of Market area and just wanted to ask Rico: What was South of Market like when you were growing up here we came here? Rico Riemedio: We came here in 1973, I came from third world country, you know, like go to school with no slippers on living like a hut and it was a culture shock when we came down here, you know, but as we live here in the SoMa. I never felt like I’m far away from the Philippines because the majority of the residents here are Filipino. There were a lot of Filipinos and I went to Bessie Carmichael. I have Filipino teachers about 90 percent of the students or Filipino and it was it was easy for me to make an adjustment because I have a lot of Filipino friends. Tim Figueras: You felt more like the majority here going up because all the Filipinos in the neighbor. Tim Figueras: Which was kind of different how I grew up because I grew up in Ingleside and they were very little Filipinos and because of that I had separated myself from the Filipino community because I wanted to be like everybody else. The only reason I think I wound up down here was because they wanted to send somebody to work at Bessie Carmichael school. After school, I was with Park and Recreation because I was one of the few Filipinos under the department. They sent me down here thinking, “Oh, he’s Filipino so he’ll be able to get along.” And that whole time I was going to myself “But I never really hung around!” So I got to learn more about my culture by being here…All of a sudden now was surrounded by a lot of Filipino kids and and and all of that. Tell me more about what it was like? Rico Riemedio: It’s different but I feel safe. I feel safe in the neighborhood. I feel and say when I get out of neighborhood. So what happened in the 90s because I remember someone, you know, writing me telling me a you know, crack came out and you know, all the gangs your now are all together because they all getting high on crack. Tim Figueras: Well part of it was because that was it, that crack cocaine started coming out and it didn’t just hit this area it it hit obviously…People would come to this neighborhood and basically buy their stuff. In the 80s when I was there there were gangs. I mean, I still remember the remnants of the gangs. Rico Riemedio: And I remember Tim, this our neighborhood right here never known to be where you go and buy drugs. Tim Figueras: When we open up the recreation center, we used to have all those lockers. And the reason we never open up those lockers was because we would hear stories that they would ask kids to run drugs. And the kids who run down or whoever would run down, if they thought they were going to get shake or shook they would dump the drugs in the in the lockers, because if they got caught, “I don’t have anything” right? And that’s basically how they basically recruiting kids. So I remember we made a big thing about trying to get so many kids to play ball because we figured that for every kid that didn’t play ball that meant they were may walking up and down six and it didn’t take long for somebody to say, “You know, you want to you want to run drugs for me?” So we kind of monitored so they wouldn’t come in or when you wouldn’t be a drive-by or all of that. And so we got those kids playing ball and I looked at it at the more teams they were on the more games they can play, guess what that was the last time they were out on the street. StoryCorps interviewer: Do either of you want to share. How much Soma is drastically changing today? Tim Figueras: When the South of Market Rec Center opened in 1990, that’s what we started noticing the alleyway and they had a lot of old houses on those alleyway, now became condos. That’s when a neighborhood kind of changing because like I said those fires move families out what started to coming in were more single people and we didn’t get as many kids as we used to. I used to get when the Rec Center first open we used to get 200 to 300 kids a day in there. You know, so it kind of changed it all and because that got changed we didn’t get this much support from the city as may we should have because there was probably wasn’t as many kids here. Rico Riemedio: You know, there’s a 25 years gap, you know, when I came back the neighborhood doesn’t feel safe anymore. You know, I see gates on stairs and I don’t see any kids playing at night anymore just hardly anybody walking on the street. Tim Figueras: I think what happened, you had a lot of people come move in here that didn’t really understand the neighborhood and they felt threatened by other people not necessarily the the longtime residents here, but they saw the other residents that were also here to homeless or whatever you want to call them right and I think then they like you said, they started to putting up barriers, putting up gates, right? Rico Riemedio: So, you know, there’s still you know, I used to work as a case manager. I work with youth that involved in the juvenile system and youth that are dealing with truancy. I get to see their living condition. It’s sad now, because when we first came here there was a lot of space for family to just live in an apartment. You know, now, you know, I see two bedroom apartment with three families living in it. 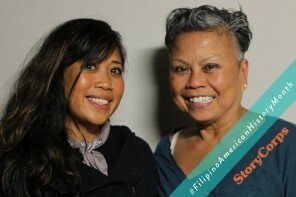 StoryCorps interviewer: Maybe some closing thoughts just about how you think that SOMA Filipinos as a cultural heritage district is going to affect the community here and maybe your hopes for it what you would like to see from having the cultural heritage district? Rico Riemedio: We deserve to have this area as a Filipino Heritage District because the fact that this neighborhood not just SoMa but even outside SoMa is predominantly Filipino residents live here. And we contributed a lot to the city of San Francisco to where they are now and I feel like that they need to start bringing business here. As a Filipino, anytime there’s opportunity for us to make this neighborhood to be more like Filipino Community, we gotta support. Tim Figueras: I do see great value in preserving that but I also see like he said the businesses have to get built up. You need to have people wanting to stay here not necessarily having to stay here. But I talk to a lot of people who have moved away and you know what? They’re not regretting moving away because they see all the negatives that are still happening in this area. I mean, we could have Filipinos living in these alleys, but if they’re afraid to go out…It just looks good in a demographic stats. Right? So I think we all have to work together to try to make this a safe and as welcoming as we can. And it needs to be preserved because people are moving out of the city and the city’s becoming not what it used to be. And that’s not just Filipinos and that’s why the people down here are really really passionate and wanting to preserve the heritage and the culture in his neighbor. And I think it’s kind of need like, you know, you introduce your friends and Filipino food and to come down in south of market and get Filipino food is kind of neat. Just like Boston and New York where they can go to Little Italy, they can go to North Beach. You could still kind of do that and you want to preserve that and have an area that’s still welcoming to everybody and yet have that bit of culture. So people can get educated on the culture…Part of it, is that they have to make this neighborhood better and more livable for people because if it isn’t , you know, the people are here that here now want out and there’s not people who want to to go in and then guess what? Then it will die. Minseo Kang edited the StoryCorps interviews. Minseo is an alumna of the Film & Digital Media Department at Dongguk University, Seoul. She is currently interning at CAAM in the Festival & Exhibitions department.